Color blocking is one of my latest obsessions. Its the artist in me and my love of odd and eccentric splashes of color anywhere and everywhere I can get them. 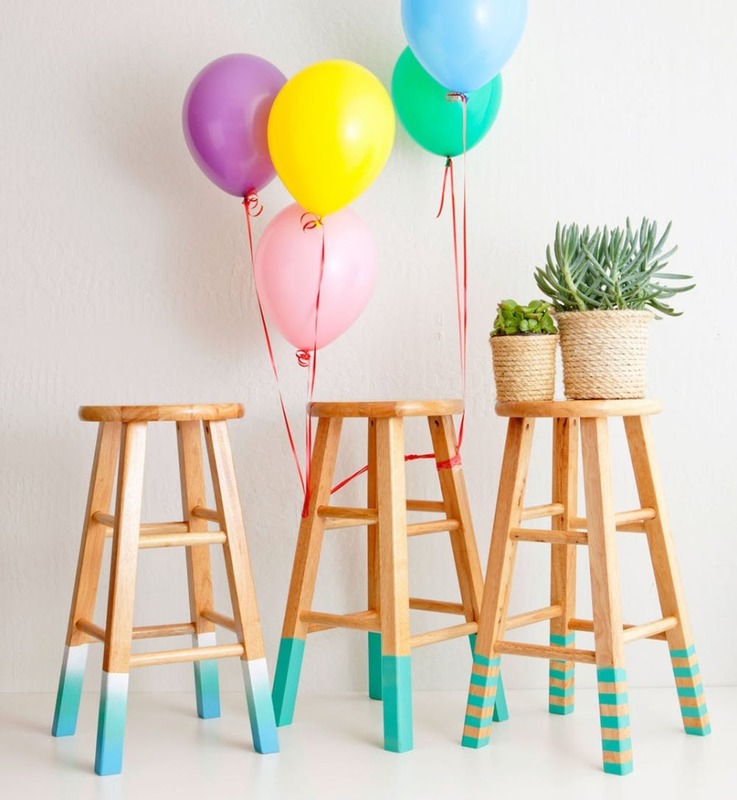 But what I love most about the idea of color blocking is that it is totally DIY-able! 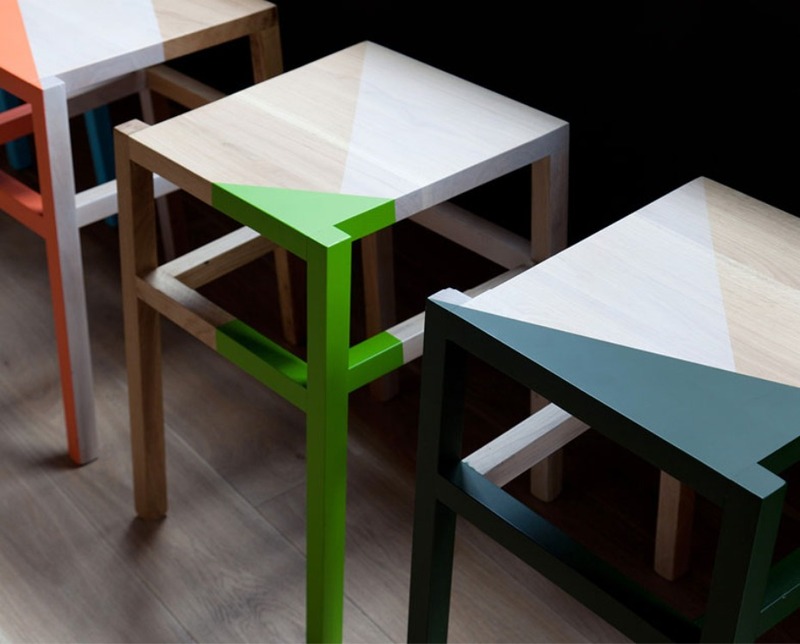 Find a great piece of furniture that you love the structure of but needs a little updating, and color block it into the modern age! Oh and if you are looking to DIY some of your own furniture for the first time I highly recommend checking out these 9 tips for prepping and painting your furniture from Apartment Therapy! But hey you have to have an idea of what you want to do before you are ready to prep and paint, so keep scrolling for some of my very favorite Pinterest finds that I wish my home was big enough to accommodate. Enjoy and let us know what your favorite is, or what your first refinished project was or will be in the comments below! Color blocking doesn’t have to be a complicated mess of geometric angles, these all white cabinets make this space far less sterol looking with a few warm color choices on the cabinet doors. Find out how to DIY your own on Sugar and Cloth. The dipped paint looks is a favorite of mine. 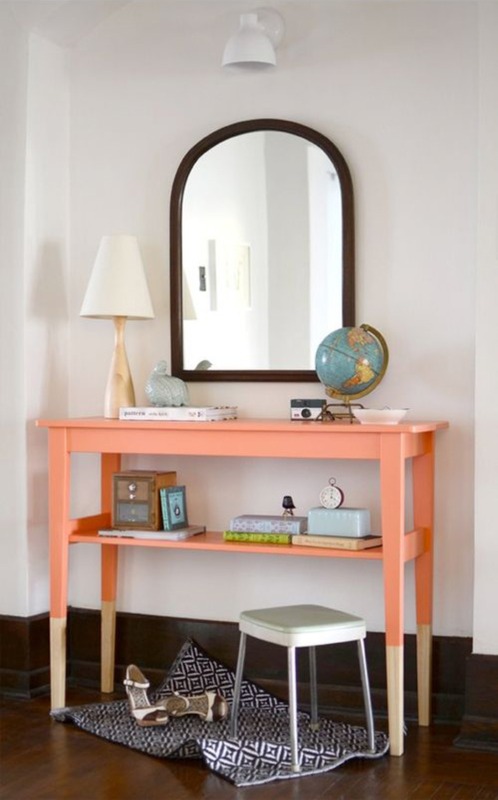 and this subtle peach paint job just gives this entryway table a warmth and welcoming vibe. Oooooh, a gold double dip! 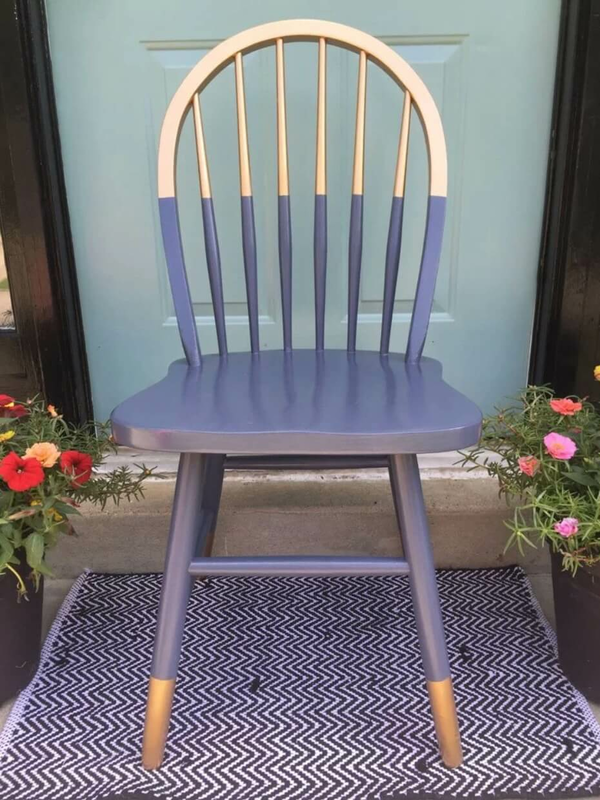 I recently refinished my dining set chairs and am can attest, painting spindle-backed chairs is a bit of a pain but the results are so SO worth it! Give your dining room a bit of glam pizazz with gold color blocks. 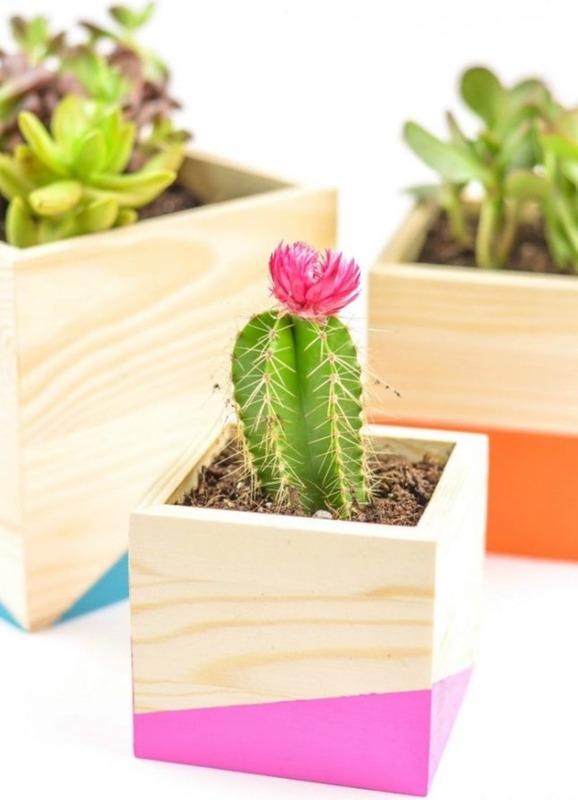 brighten up a window ledge, your side table or even your office desk with a cute little color blocked planter. And for those of us that have trouble keeping plants alive (raises both hands in the air) succulents or a cactus are the perfect plant. You can make your own with help from Simplistically Living. These have been on my Pinterest DIY board for YEARS!!! 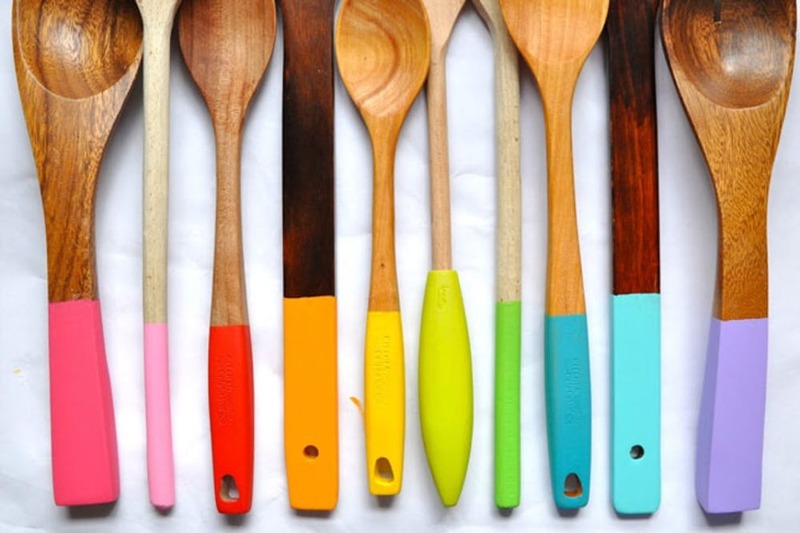 I keep meaning to take all my leftover paints and paint my wooden cooking utensils in my kitchen. Make your own today with this DIY from Little Bit Funky. Color blocking can be super subtle and chic. 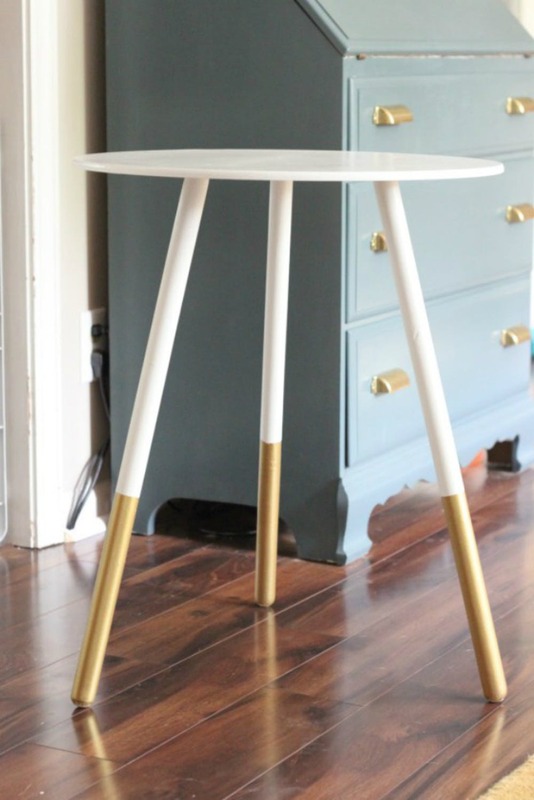 You don’t have to go overboard with wild colors or designs, just a simple gold accent on the legs of your side table can do a lot for your space. This DIY is waiting for you at Chasing Shiny Objects. Matching chairs with unique color blocking set them apart but also identifies them as a pair. 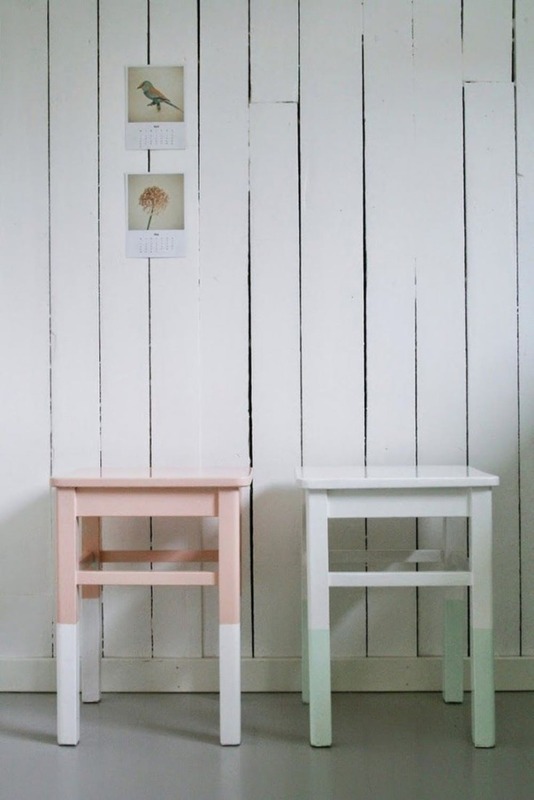 And this pastel pair has me on the lookout for some super cute stools. 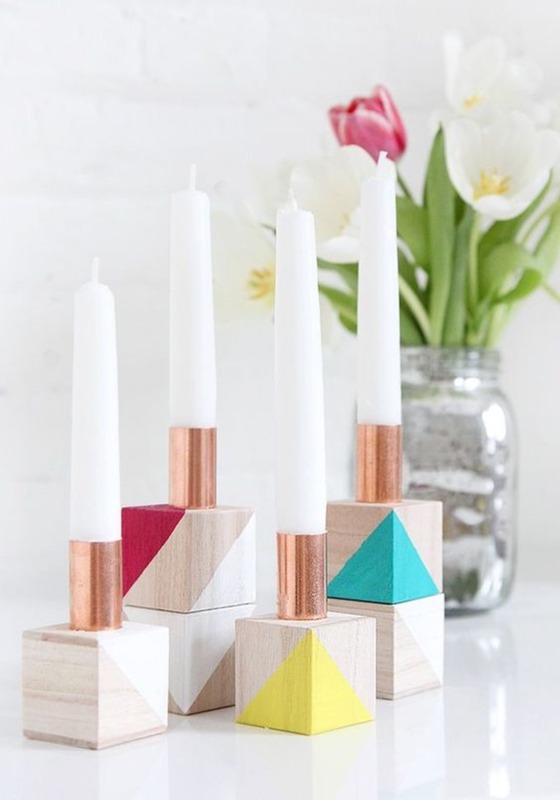 Add a modern and funky fun style to your dinner table with color blocked block candle holders! 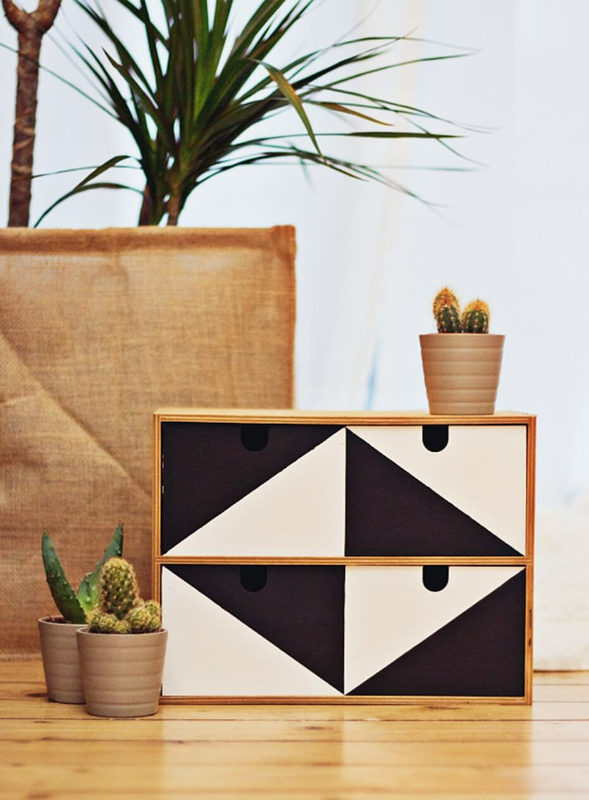 Have a drab looking jewelry box? This simple design will turn it into a modern gem! You can find the full DIY at The Life Factory. 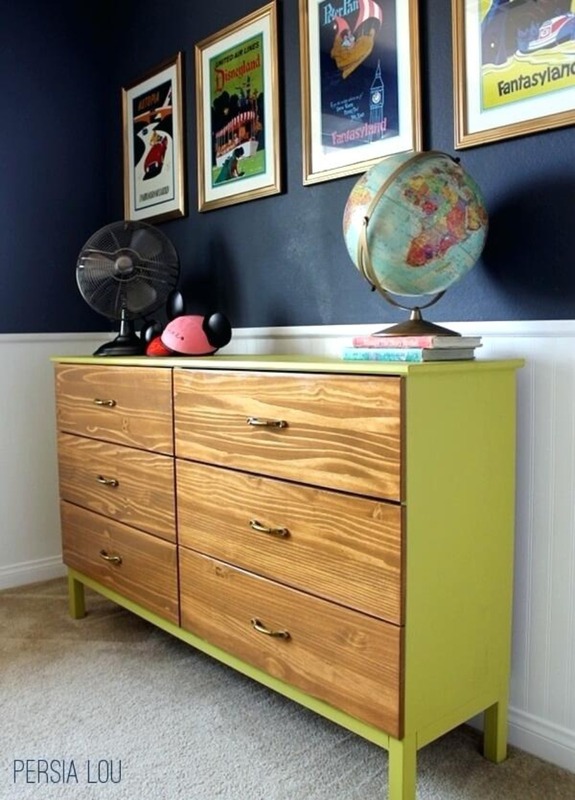 This cute split pea color blocked dresser preserves a bit of its mid-century style with the original wooden draw faces. So in LOVE with this piece! Learn how to do this DIY on Persia Lou. I don’t know how many of these exact same bar stools I have sat on in my life. Make yours stand out from the crowd with a little color blocking design. You can find out how to create all three of these looks at Brit + Co. 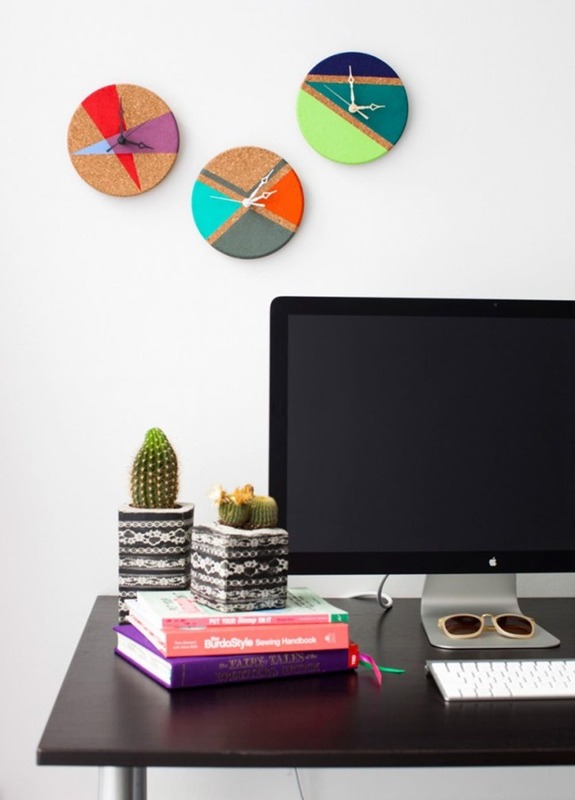 Even if you don’t have to keep track of multiple time zones these fun color blocked cork clocks are a great way to dress up any wall! 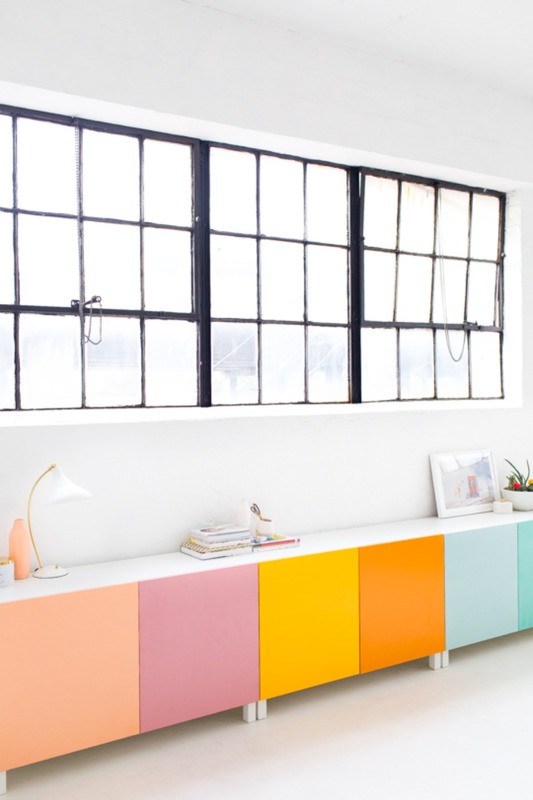 You can find the full DIY on Brit + Co.
Oh and don’t think you have to limit your color blocking ways to just furniture, color blocked wall is so very rad too. I may not be a huge fan of baby pink but this desk set up would have made me a steadfast student!